Movie recommendation systems usually ask you to rate what you like or dislike so it can bring you recommendations from other users with similar tastes. Modern applications like Netflix improve upon this approach by adding the movie characteristics in their algorithms. But recommendation systems does not work only for movies. They are also very popular for books and music…but not so much for video games. Indeed there are a lot of game databases online, but they do not have the objective of recommending games, so their search and recommendation options are pretty limited. Game Discovery is a web application that fills the gap for recommendation engines targeting video games. It uses only game characteristics, without the need to spend time rating games, allowing users to get quick results for simple or complex queries. The secret that powers the system is the manner the data is structured, a graph database known as Neo4j. 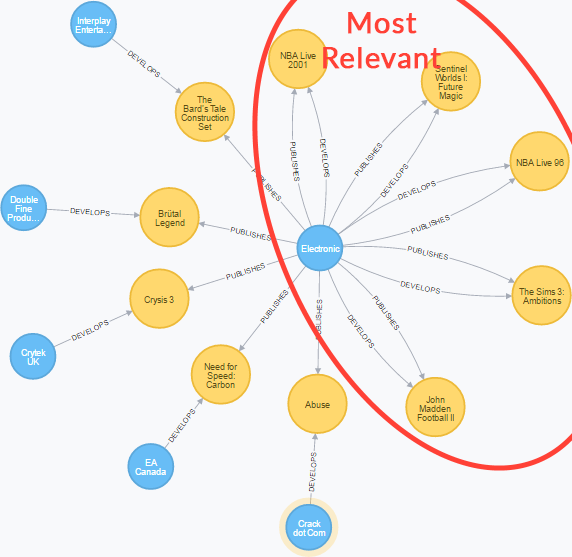 The recommendation algorithms running at Game Discovery heavily rely on the graph layout of the data and this was the reason why Neo4j was chosen over other types of database like relational or document databases. As stated by many specialists, the more data you have, the better the recommendations you can provide. I would complement by saying that having data in an easy format to manipulate also helps a lot. The following query gives a hint of how data is structured at Game Discovery. There are conceptually only two types of nodes, Game and Characteristic, and both have only basic attributes like unique id, name and description. Characteristic nodes can be everything that describes a game, such as: Company, ReleaseYear, Genre, Theme, etc. All game nodes are connected to characteristic nodes and sometimes a characteristic node is connected to other characteristic nodes. Some examples are a developer that works for a company, a location that has sub-locations or a character having a fictional race. The power that makes recommendations work comes from the relationships: they all have a single relevance attribute that indicates that some relationships are more important than others. For example, two games are more similar because they feature the same characters or are part of the same series than two games that were published by the same company or have the same genre. Relationship directions do not really matter, so the graph is treated as an undirected graph. It is possible to make complex queries in Neo4j using Cypher, but when talking about graph algorithms, there are libraries like Python NetworkX and R igraph that covers a lot more ground. Because of this, Game Discovery runs its algorithms in memory using a simplified and modified version of the graph containing only the node ids and relationships. After an algorithm is executed, the rest of the data is loaded from Neo4j to be displayed to the user. The main modification to the graph being processed in memory is that relationships between two nodes are grouped; their relevances are summed and also inverted, so the higher the relevance, the nearer to zero it will be. The reason for this is to allow the system to run shortest path algorithms, making the shortest path the one with the highest relevance between two nodes. When the user searches for one or more game characteristics, the system uses single-source shortest paths for every characteristic searched to get the more relevant games connected to them, then it merges the results and we get the smaller ones as the more relevant items. 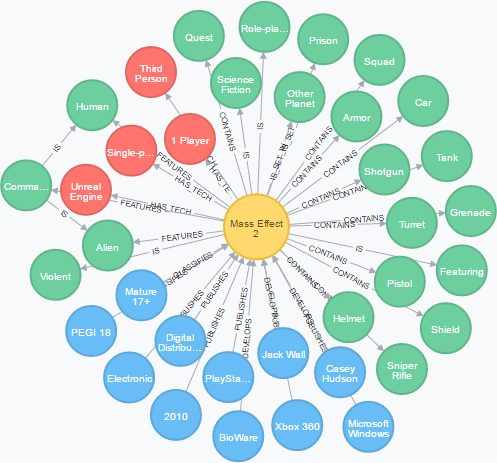 In the following example, the selected games are not only considered more relevant because they have more connections with the searched company (Electronic Arts), but also because the DEVELOPS relationship is considered to be more important than the PUBLISHES relationship. Hierarchical queries are a strong advantages of using this path traversal approach. For example, when a user searches by game sets in Europe, it doesn't just return nodes for games directly connected to Europe. It will also pull up games set in Italy, France, Germany or other European countries because these countries are connected to node Europe as a sub-location. When the user searches by a game, the system checks which neighbor games share most characteristics with the selected (i.e., searched-for) game. The higher relationship relevances then are taken into account. The ones with the highest score are the more relevant. There is still room for improving the recommendation algorithms, like considering the number of hops or the sum of N first shortest paths between two nodes, but the current implementation has served to prove it works. The larger and more precise the data, the better the results it can provide. Want in on awesome projects like this? Click below to get your free copy of the Learning Neo4j ebook and catch up to speed with the world’s leading graph database. 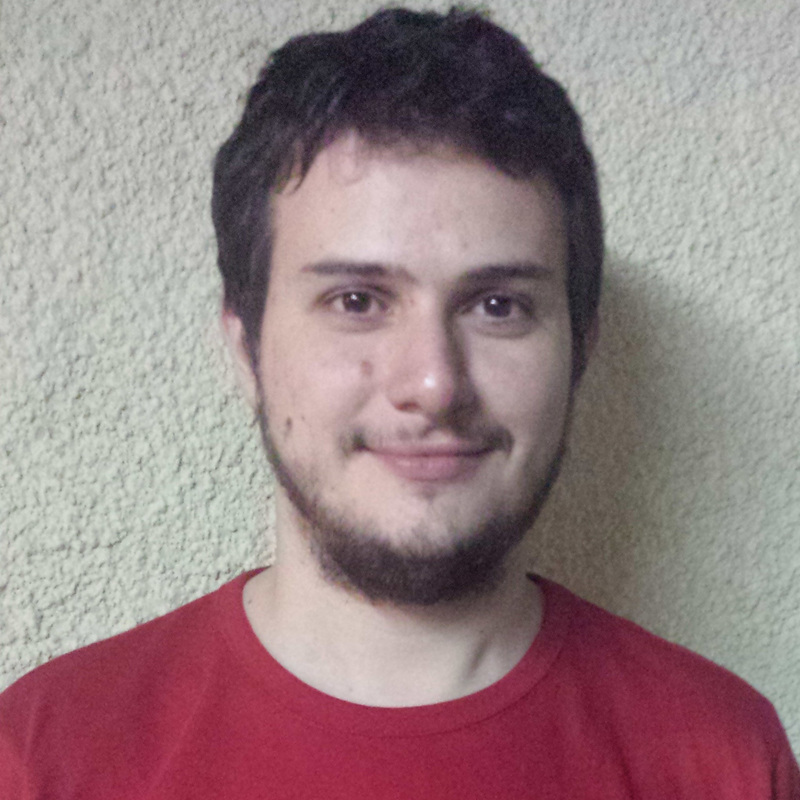 Renato Dinhani has been building traditional enterprise applications since 2010 using Java and .NET stacks. Also a gamer, since 2015 he is putting effort into bringing to life Game Discovery, his long-lived idea of a tool to discover new games based on the game characteristics. Saw this recently and thought I’d contribute to it. This games suggestions website http://gamessuggestions.com has many of the features you mentioned. First of all, it has an automatic recommendations system that allows users get games suggestions randomly from their large database. It also has smart search filters that allow visitors customise their search as they navigate through the games directory. As I understood from the article, the filter by game feature doesn’t tolerate errors in user responses. So if user is uncertain about some features or has a wrong idea, the algorithm may fail. Please, consider ProbQA algorithm for toleration of errors and a website to try it in action: http://probqa.com/ . The source code of ProbQA is available on GitHub. I would appreciate talking to you if we can combine our efforts in some way. The current difficulty I see with my approach is that the knowledge base has to be populated manually, spending 1-1.5 hours for each game to understand its details, and then answer the questions to teach the knowledge base. Do you have ideas on how to automate such things? So do I understand correctly that you use some automation for extracting the game features? Yes, I wrote some scrappers for some game related sites. Today my main goal is to use Wikidata as the main source of data. The main problem is that many games does not have enough data to get good recomendations, or that the data is inconsistent across games (example: one game is related to RPG and Action, and other game is related to Action-RPG).